Looking back at the origins of D&D, the first edition of the game has almost 2/3 of a page dedicated to the concept of adventurers becoming lost and subsequently offers suggestions on how to handle parties that lose their orientation. Now looking at present day, the rules in D&D5e have atrophied to less than 1/4 of a page, with very few guidelines being presented. Given how small that section is in the 5e DMG, I’d be surprised if very many DMs concern themselves with checking to see if a party did, indeed, become lost. Which is a shame, because exploring the unknown and traveling across vast tracts of wilderness needs to taken seriously and stopping for instructions leads to role playing opportunities. The rules in D&D1e are largely based on the intransmutable foregone conclusion that you will be using hexes on your overland map which in turn simplifies the handling things like getting lost. 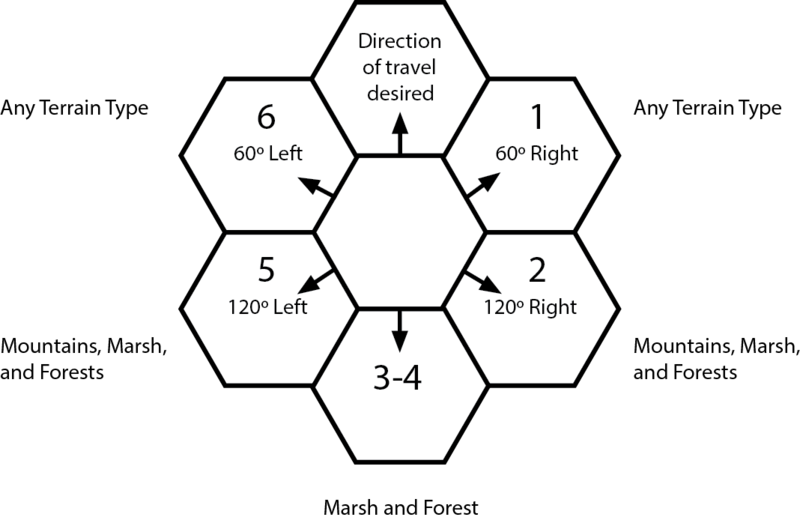 Without a hex grid, the rules for getting lost might require a compass, ruler, pencils, and a discussion that that would probably consume quite a bit of space and hence we get the very slim set of rules in D&D5e. Becoming Lost: Any party not guided by a creature knowledgeable of the countryside through which the party is moving, or which is not following a well defined course (river, road, or the like), or which is not using a well-drawn and correct map, might become lost. This is determined prior to the commencement of a day’s movement. Determination is based on the terrain…. Unless they are following a path, or something like it, adventurers traveling in the wilderness run the risk of becoming lost. The party’s navigator makes a Wisdom (Survival) check when you decide it’s appropriate, against a DC determined by the prevailing terrain, as shown on the Wilderness Navigation table. If the party is moving at a slow pace, the navigator gains a +5 bonus to the check, and a fast pace imposes a – 5 penalty. If the party has an accurate map of the region or can see the sun or stars, the navigator has advantage on the check. In the Gygaxian original view of the possibility of getting lost, a daily check is necessary. In the lore of 5th edition, it is up to the DM to determine when he wants to check. This allows you to remove much of the randomness that could interrupt the telling of your collective story. For instance, it doesn’t make much narrative sense to be riding wildly to warn a town an impending invasion of a horde of lycanthropic halflings and then suddenly take a wrong turn and get lost. In the Gygaxian original view of the possibility of getting lost, a daily check is necessary. You will note, however, that no preference is given to Rangers, Druids or even Wood Elves – only to those with the survival skill. I like it because it is uniform, but it might surprise the party druid or ranger to learn that he is not the go-to source of woodland navigation without the survival skill. All of this thus far is making fairly good sense if it does make an overt reliance upon the survival skill. But what about the nature skill? Why isn’t it used? The nature skill is a knowledge of a thing – it is passive, descriptive, informational. Survival is hands-on, the doing of a thing – it is an active skill. Nature could, in fact, be helpful – your character might know that lichen only grow on the southern side of the rocks and stones in this region therefore be able to re-orientate the party – still lost, but now sure of their direction of travel. There is a time penalty for getting lost (1d6 hours to re-orientate) – the nature skill could and should be used to reduce or even negate that penalty. Why did the 1st edition rules specify a check first thing in the morning? To start with, the entire day would be spent moving in a random direction. Until the terrain changes significantly or an unexpected river or other easily recognized terrain marker appears, the party does not know they are actually lost. This allows the DM to place the party somewhere on the map and then later inform the party that they are starting to suspect that they might not be heading the right direction. Generally speaking, becoming lost is the realization that you have been wrong about where you are and where you have been going. In game parlance, you must have moved unwittingly in an incorrect direction. How does a party discover that they are moving in the wrong direction? As previously mentioned, they could encounter a terrain distinction of some sort IF they have a good map. Cutting across roads or trails might provide them with a clue if you’d prefer to role play the discovery. Missing expected landmarks (towns, river fords, a mountain pass, etc) is another way for the party to become aware that they are adrift in the wilderness. Travel time in the wrong direction is needed for the party to be, by definition, lost. The 5th edition rules say that you can check at anytime to determine if the party becomes lost, but in order for this to mean anything, some actual travel time in the wrong direction is needed for the party to be, by definition, lost. So I would suggest that once a party becomes lost, that at least half a day travel happens before they become aware of any hint of a problem. Direction of travel once lost – expanded version based upon the diagram shown in AD&D 1e Dungeon Master’s Guide page 49. I had mentioned earlier that travel provides some role playing opportunities. If the lands are inhabited, the party would be wise to occasionally have a chat with a local. This would allow them to get a picture of what is happening in the area that might be of interest to the party (grim hints of a lycanthropic halfling horde, for instance) while confirming their bearings. But then, everyone hates to stop and ask for directions – according to my wife, this is especially true of men. In terms of winners and losers, AD&D 1e -vs- D&D5e, which one is better for handling getting lost? I prefer the clever way that D&D5e handles the checks, but I also like the more hex-centric rules and handling of being lost afforded by the older 1e rules. Using a fusion of the two rule sets and home brewing your campaign rules for getting lost is the way to go.